Welcome to Bali! Sorry guys, can’t seem to move on from that Bali craze. But who can get enough of Bali, anyway? If you haven’t seen our first Bali trip then check it out here. If you live in Jakarta and Bali just one hour and 45mins of flight away, then you can bet you will want to visit this place often. But let’s just be real, who don’t want to go here often, right? This time is different because I am actually going for a company outing. You know, where you go somewhere with your office mates as part of office bonding kinda thing. I find most of the company outing usually boring. You have to go somewhere with people that you might not close with and forced to do come activities with them. Is it just me? Am I being too real here? LOL! 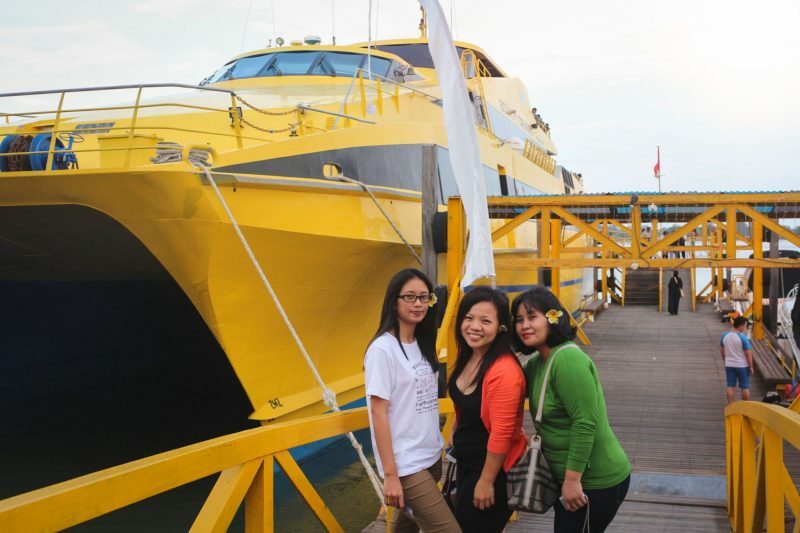 But when we all knew that we were going to Bali, the atmosphere drastically changed. Everyone actually looking forward to the outing. With that being said, I can’t really break down the cost because everything was already taking care of. But I will try to find out how much each thing cost. So you will get roughly how much it cost. We were going on the weekend, from Saturday until Monday. I would love to stay longer, but hey, be grateful right. 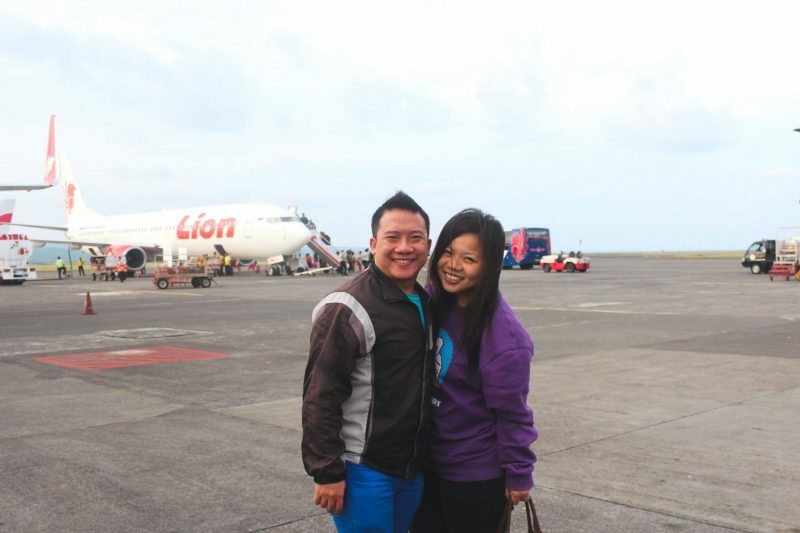 We were taking the earliest flight from Jakarta to Denpasar by Lion Air. Their first flight was at 4.30am. There is 2 reason why we took the earliest flight. First is due to time efficiency reason. So we have more time to explore Bali. Second is because Lion Air is known for delaying its flight. It got so well known because of this that people would say if you don’t want your flight to be delayed then you better take their first flight. We ain’t taking that chance of having out flight delay so the first flight it is. Everything was smooth at the beginning. I went to the airport and met with the others. Some people haven’t shown up yet but we still had lots of time. 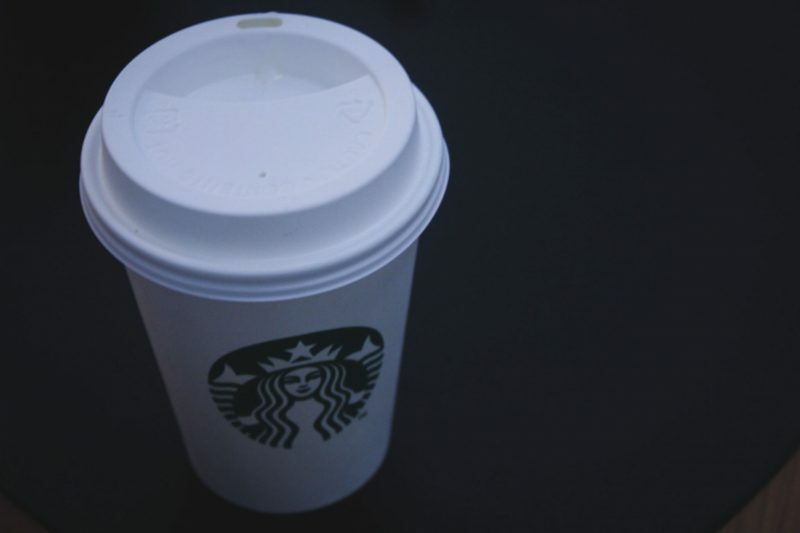 I even got time to grab myself a coffee. Next time you know, it was time for us to board the plane and there are 3 people who haven’t shown up yet. Let me tell you one important thing, write this down. The flight would not wait for you. I repeat, the flight would not and should not wait for you. No matter who you are, if you going to make the whole flight wait just for you then you better have your own jet. This is common sense, yes. But I still see lots of people do this thing. Buying that plane ticket do not make you own the flight. So, suit yourself and be there on time. You do not have to be there 3 hours early but at least be there just in time. Do you get that? Are we on the same page? Good. It was still dark when the flight finally take off. The weather was kind of cloudy. Because we were going to Bali that was not a good sign. 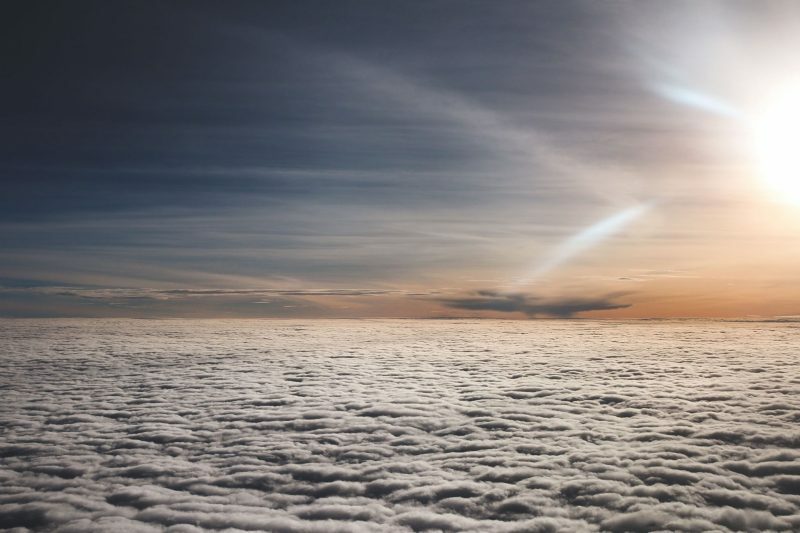 But the view changed after the plane has passed through the gray clouds. It was stunning! Basically, I just enjoy the view. The flight, not soo much. It was okay but nothing special. 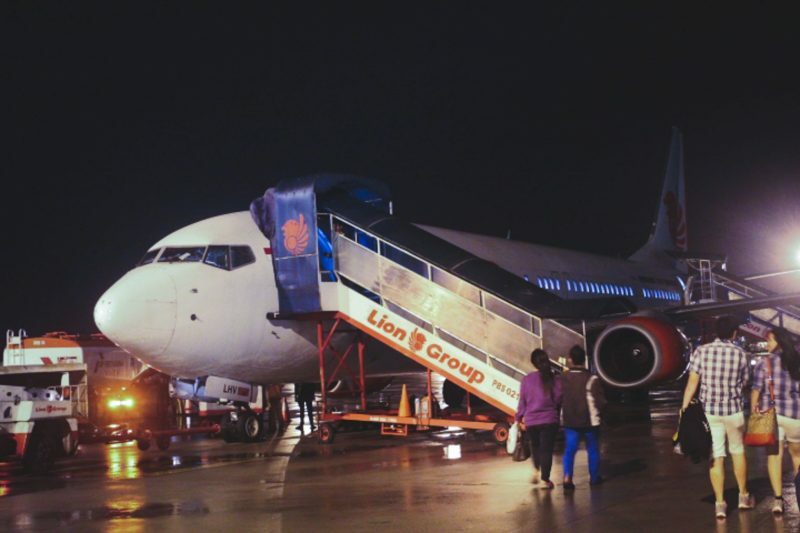 Lion Air is a low-cost carrier after all. There was no meal and flight entertainment, just a basic flight. For me, I don’t mind. I was making myself busy trying to get all the picture of the view. And they did not delay, so all good. Then the next thing I knew, we have arrived! 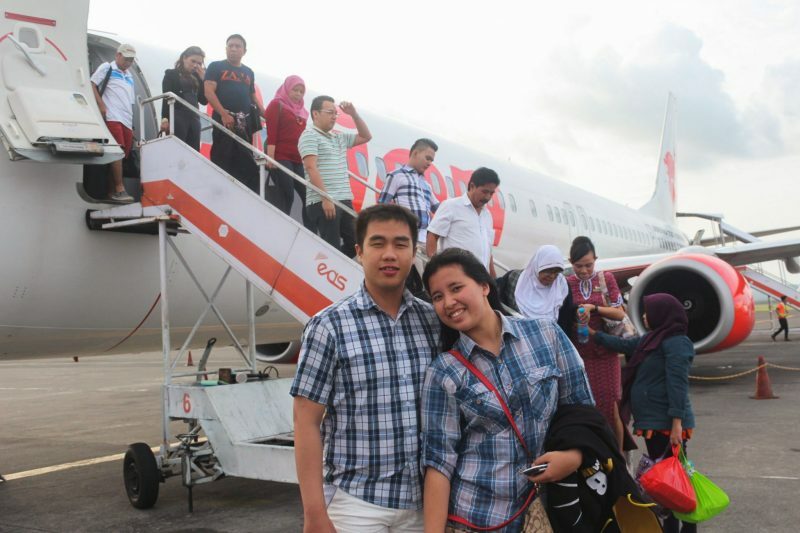 We landed at the Ngurah Rai International Airport which was named after I Gusti Ngurah Rai, a Balinese hero. After we went out from the airport, we met our guide, Made. Fun facts about Balinese name, they have their own version of naming system. It is determine by the birth order. The firstchild is “Wayan” or “Gede” or “Putu”, second is “Made”, third child is “Nyoman” and fourth child is “Ketut”. There are maybe other variation of name but these name are the most common. You will meet lots of Gede more than you think you would, the same goes with other names. So, don’t be confuse if your guide and shop seller both named Made. They are most likely not related. But you can be sure that they are the second child in their family. Interesting, eh ? Because there are only 9 of us (minus the 3 people who will be joining us later), we were using a minivan. Made gave us this box once we all got to our van. He said it was a snack. 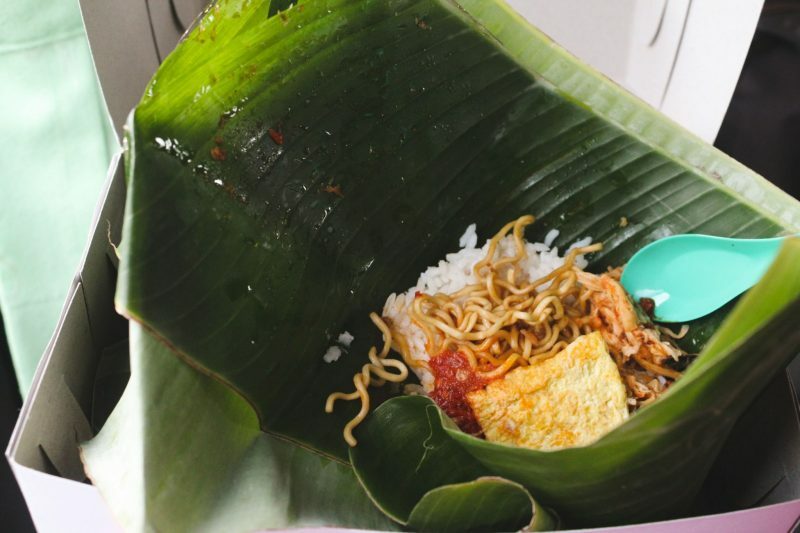 It consists of rice, fried noodle, egg, shredded chicken, and spicy sauce wrapped up in banana leaf. It is called Nasi Jinggo. The portion was tiny! No wonder he said it was a snack and no wonder there were 2 of them in the box. But it tasted soo good, as expected. Not a bad first meal at all. There were also 2 rice crackers in the box. The portion was tiny! No wonder he said it was a snack and no wonder there were 2 of them in the box. But it tasted soo good, as expected. Not a bad first meal at all. There were also 2 rice crackers in the box. We were heading straight to Kintamani from the airport and it took around 2 hours. 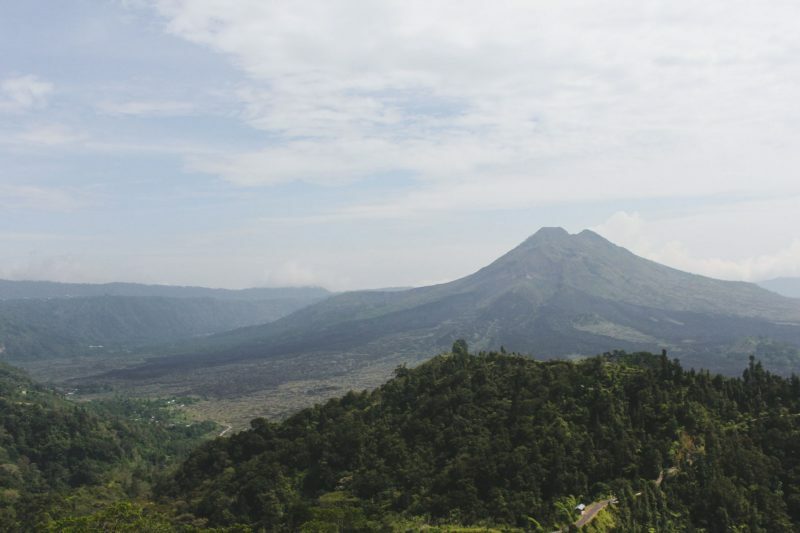 It is an area around north Bali at the Mount Batur caldera about 1,500m above sea level. 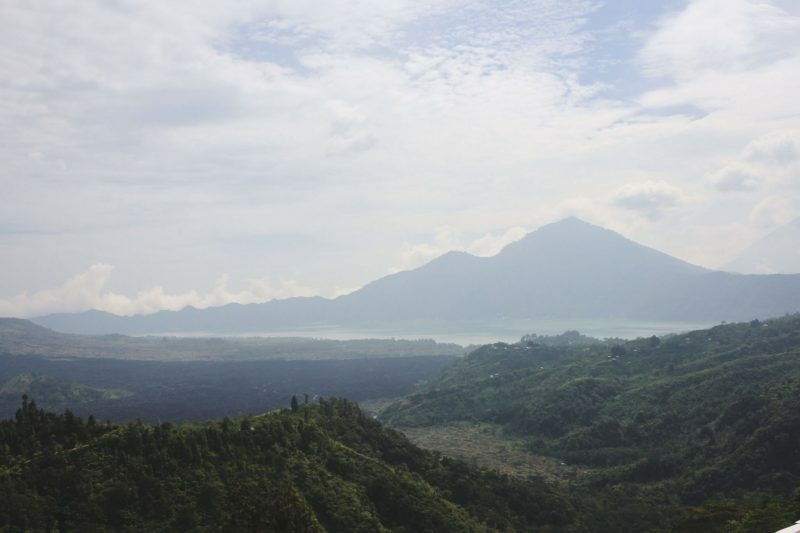 It is famous for views of the active volcano Mount Batur and Lake Batur. We didn’t get to visit the lake this time but we did enjoy the scenic view of the mountain. The mountain was surrounded by this thin mist plus it was cloudy that noon. The weather here is also cooler because of the higher ground compare to the coast. But it makes the whole atmosphere really calming. 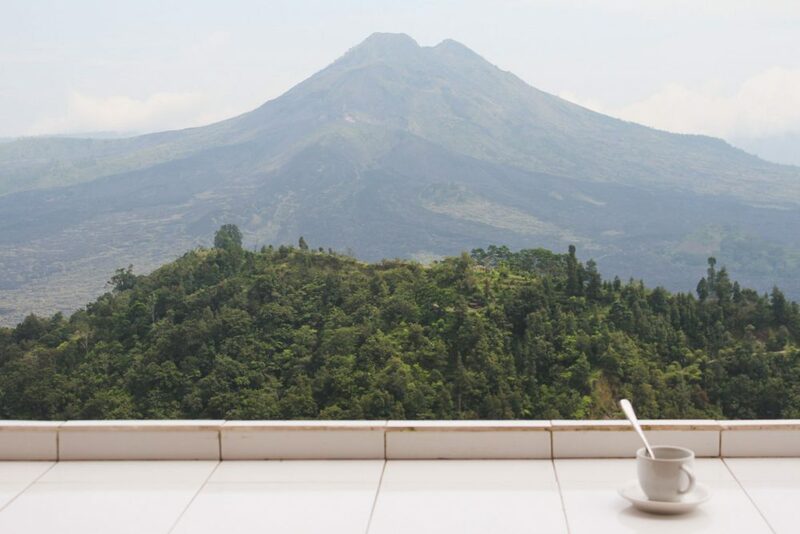 Just the perfect weather for a cup of warm tea while enjoying the view. We stopped at this restaurant for lunch. The food was okay, we all just get the same basic fried rice. This is the type of restaurant that usually serve group tours. I see more than one group eating here at the same time. A standard restaurant that you might not pick if you are going by yourself. The restaurant was narrow but long and located just beside the main street. I can even see the street from the other end of the restaurant. But the view was something else tho. 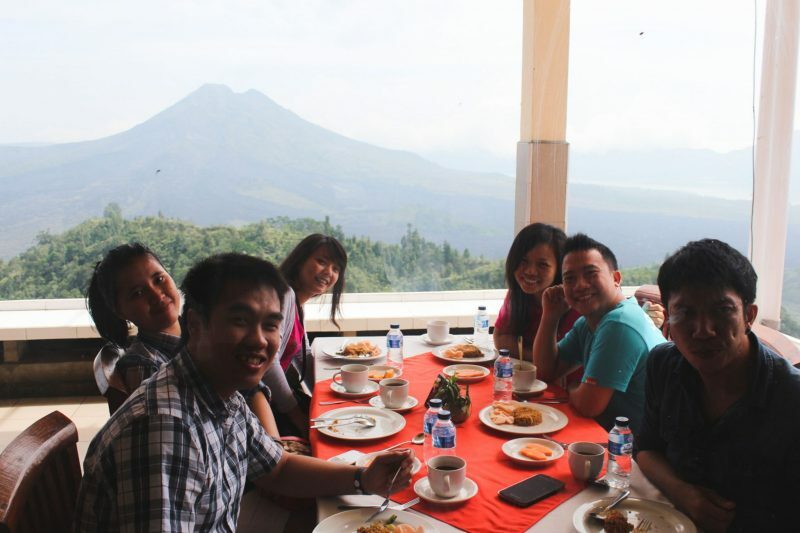 The restaurant located on the cliff overlooking the mountain. It made my fried rice taste way better to eating with this kind of view. Also, the weather was cooler than what I expected. Chill but not really cold. From this side, you can see the street. The boring side. Hello from the other side. The amazing side. I am trying to take the view guys, not you two..
Our first schedule was cycling. 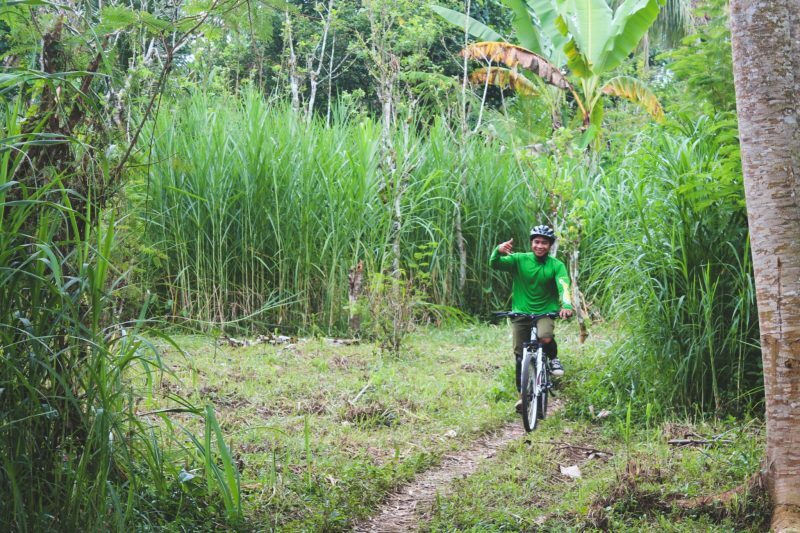 I know what you think, cycling in Bali? Why ? Just why? To be honest, I also don’t know. I guess they thought they might give us something different since most of us have been to Bali before. Well, I am up to something new so I just went along. After filling our stomach, our guide gave us a shirt to change to. It was bright yellow with “Alam” logo in front. 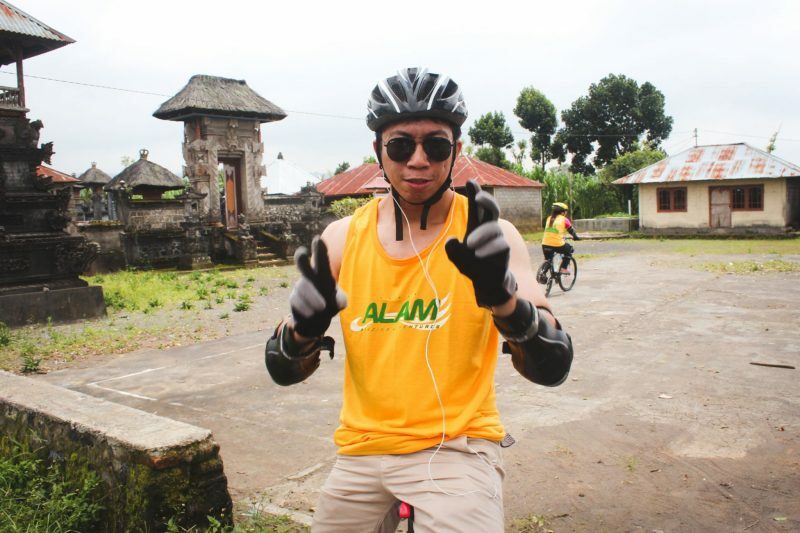 Alam is the name of the company that arranged our Bali cycling trip. 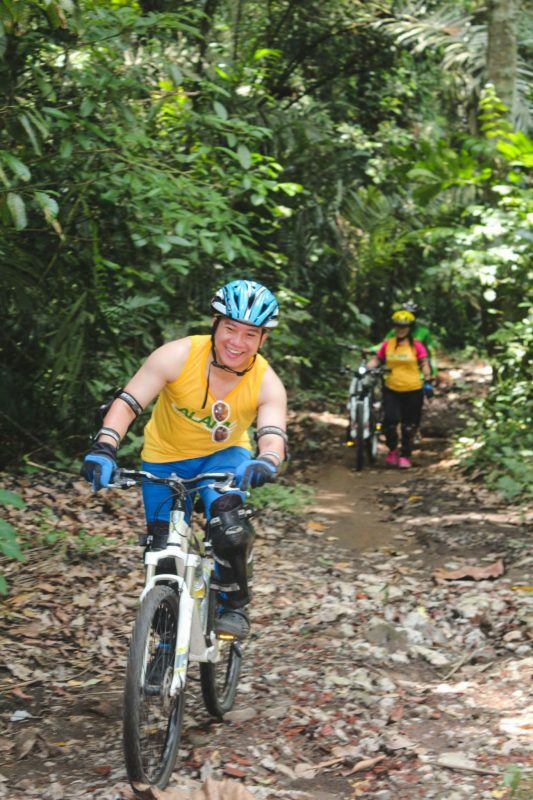 They specialize in adventure package and nature preservation. Founded to share the activities in exploring the nature, at least that’s what they said. 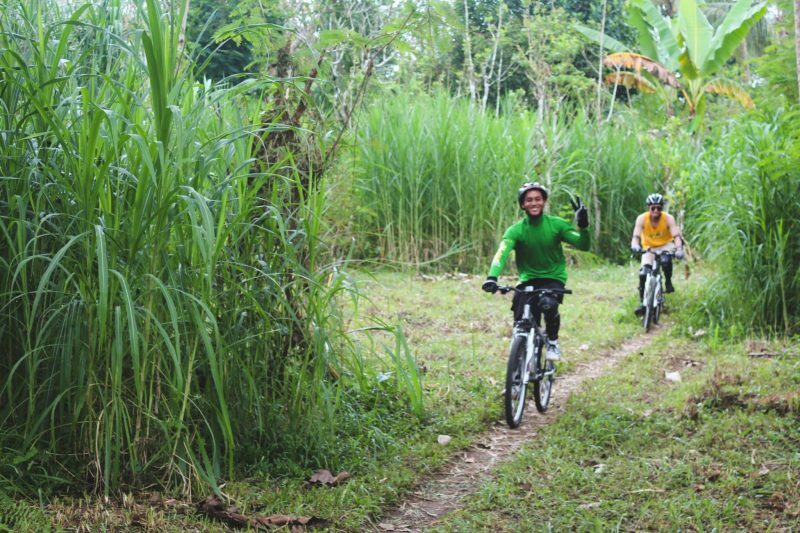 It cost IDR 1.188.000/person for the cycling package. Group photo. They don’t realize know what’s coming next. After changed, they dropped us in this field with all these bikes parked on the side. Then they gave us all the safety gear, helmet, elbow and knee pads. They also helped us put all the stuff on. 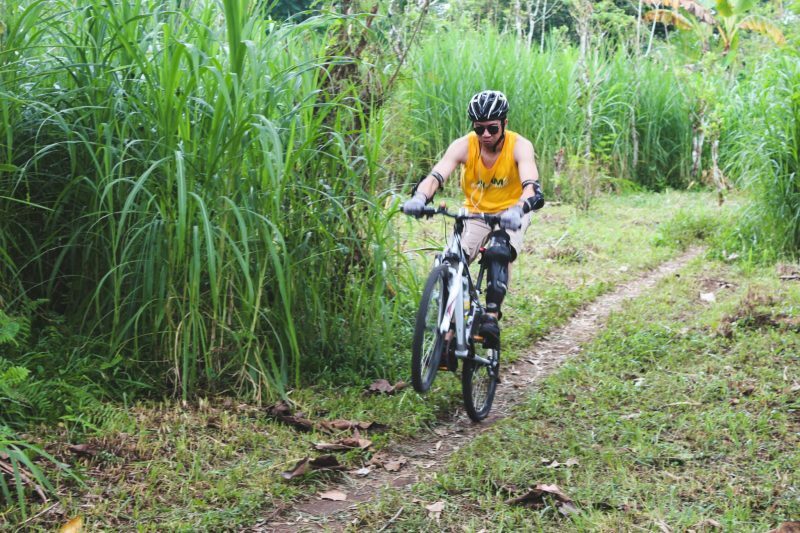 After that, they let us chose the bike that we want to us and helped adjust them if they were not comfortable enough. They gave us some time to try the bike, cycling the field. When it’s been such a long time since you ride a bike, you might need a while to adjust yourself back. But once your body remember it, then you’ll just instantly get the hang of it. Finally, after everyone was good with their bike we gather around for a short brief. After everyone was good with their bike they brief us about how the cycling will go. There were 2 people that went cycling with us. One in front of us to guide the way and one in the back to make sure no one left behind. 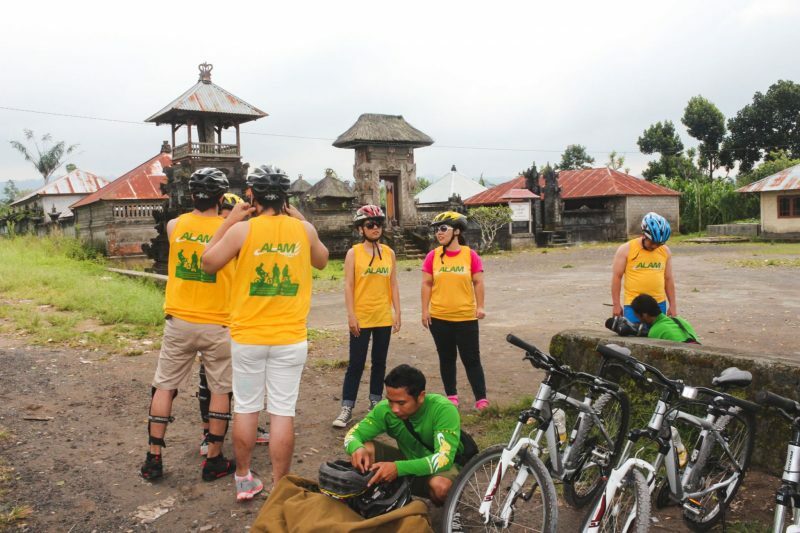 We will do this Bali cycling from Kintamani to Ubud and it will take around 2 to 3 hours. They also explained the instruction and safety standard procedure. Also what we should wear, remember to wear sunscreen and all our stuff will be kept with our guide etc. 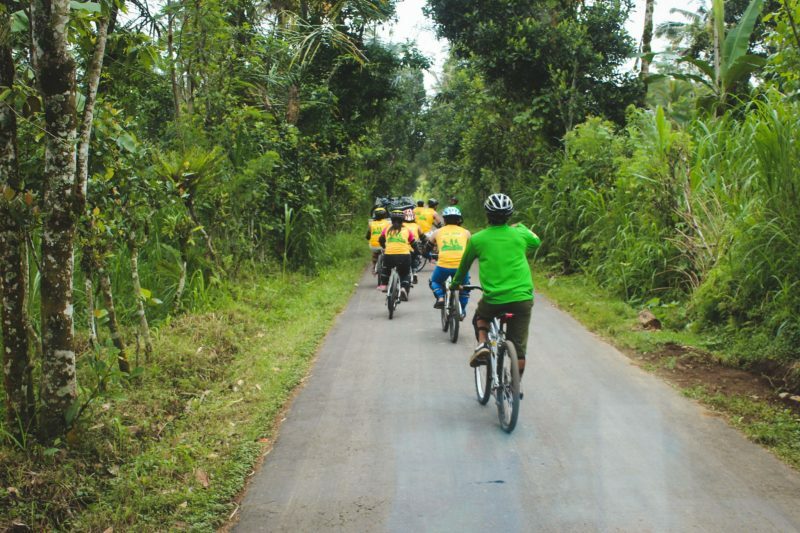 Now, there are 2 things that I regret badly from this Bali cycling trip. First of all, the sunscreen. 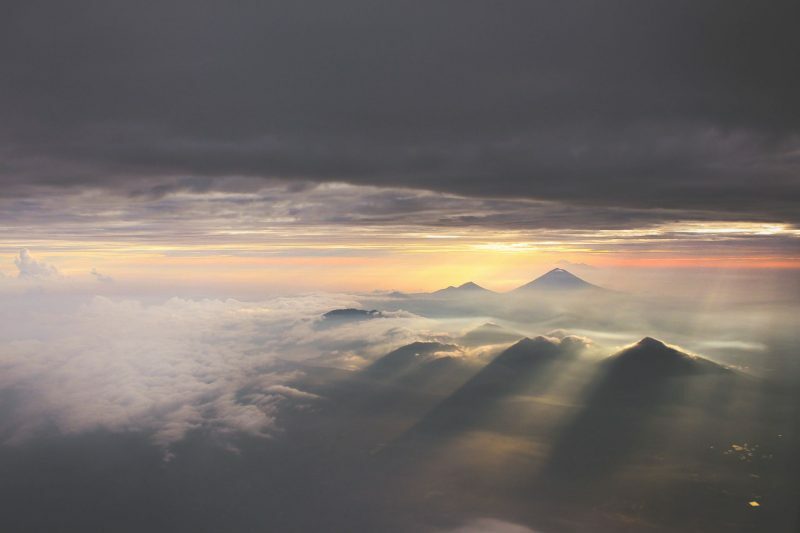 The sky was cloudy and in Kintamani the weather was soo chill. So I did not think I will need one. This backfire soo hard. As a result, I get the worse sunburn I ever had in my entire life. I will show you the picture in the next post, but it was really bad. The weather went from cloudy to extremely hot pretty fast. So always wear your sunscreen people! The second was how far Kintamani to Ubud really is. See the map below for your information. 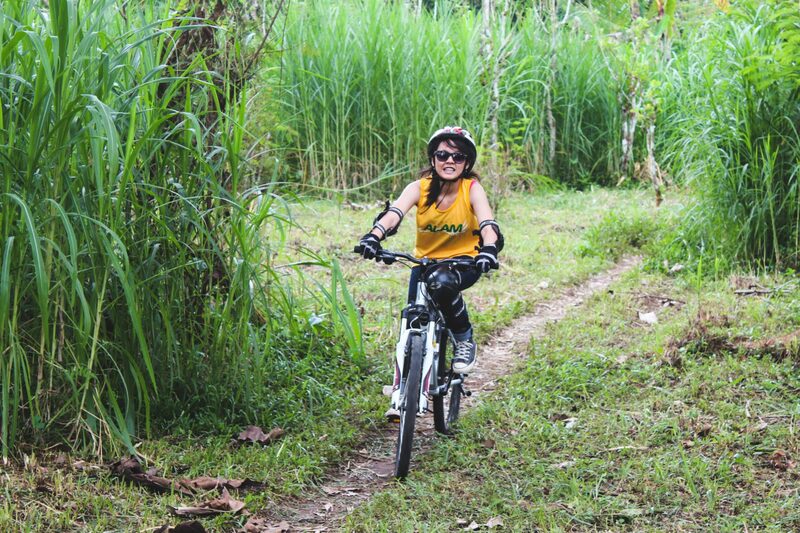 I thought this will be just a casually biking around the rice field and stuff. Oh boy, how wrong I was..
Then off we go! At first, we were going through the bigger road with our van following behind us. But the road we took was really diverse. There was some point where we went through a smaller road, passing through a rice field, then back to the bigger road again etc. So besides cycling, we actually get to enjoy the view that you can’t really see if you just went by bus or by car. Even some of the road was too small for any motorcycle. When we first start, we were going through the big road. Our van still able to follow us behind, easy. Everybody was enjoying the cycling. Next, we were going to the smaller road which our van can no longer fit. Okay, this feels a bit like exercising. Then we were going off road. This when some of us starting to think, what have I put myself into ?? LOL! There was one person from our group who finally gave up the cycling. So she went with the van with our guide and met us at the finish point. 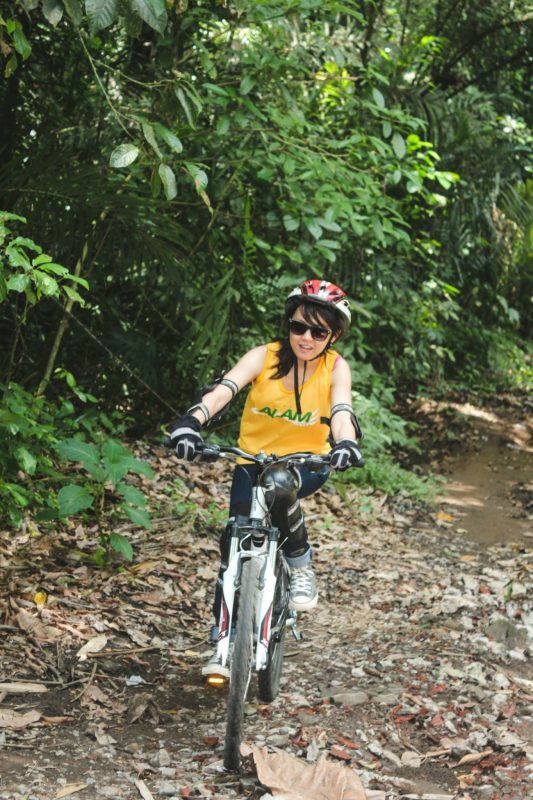 The cycling guide was really helpful. One of them accompanied her until we get to the bigger road and find our van. But I can’t blame her tho, it was tough. But at the same time, the view was really scenic, so it’s worth every drop of sweat. My friend in the back, she had enough. The finish point was in a small Balinese bale. Bale is a pavilion in Balinese. The interesting thing is that it was inside a small village. So when we need to use a toilet, it was a toilet inside someone house. But it seems to be part of their cycling program. 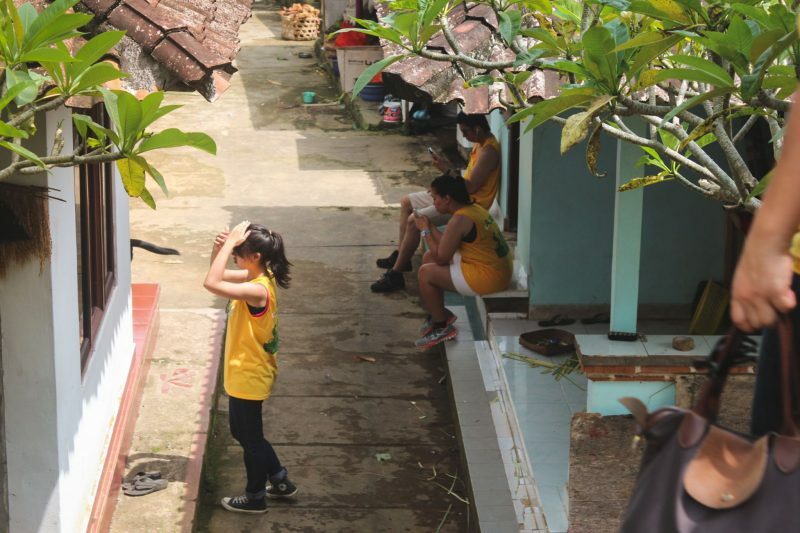 We got a glimpse of Balinese family house. Also, all the people around the house did not seem to bother. Seems like they all get used to it, I guess. Some of them even talked to us, including this one grandpa. 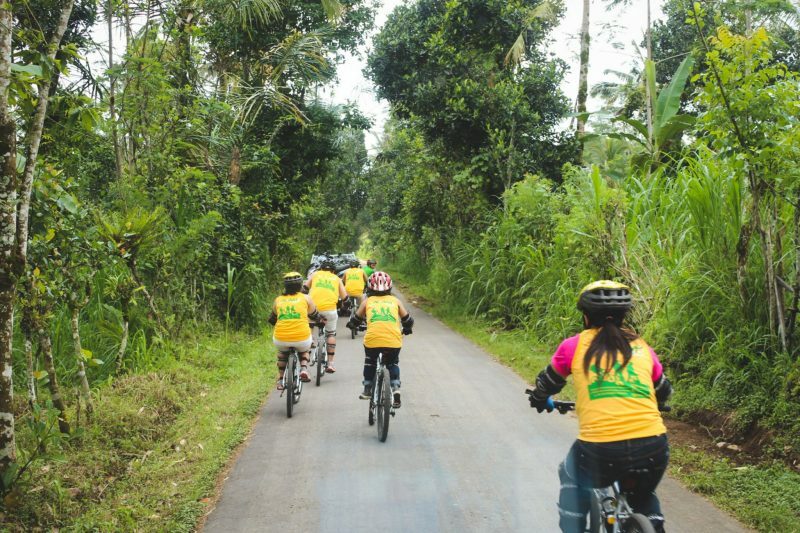 Overall I was enjoying the whole experience of this Bali cycling thing. 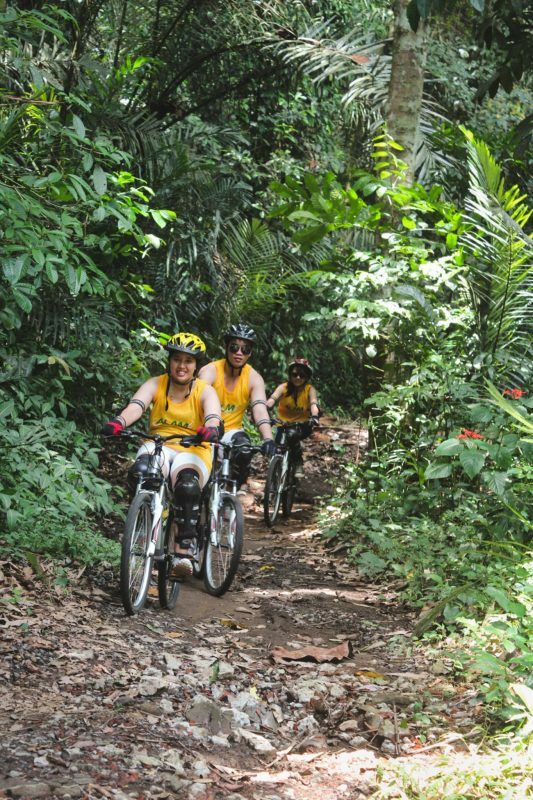 It wasn’t just cycling but you get to see the view and even interact with some local. So, I highly recommended. After that exhausting experience, we went straight to lunch. 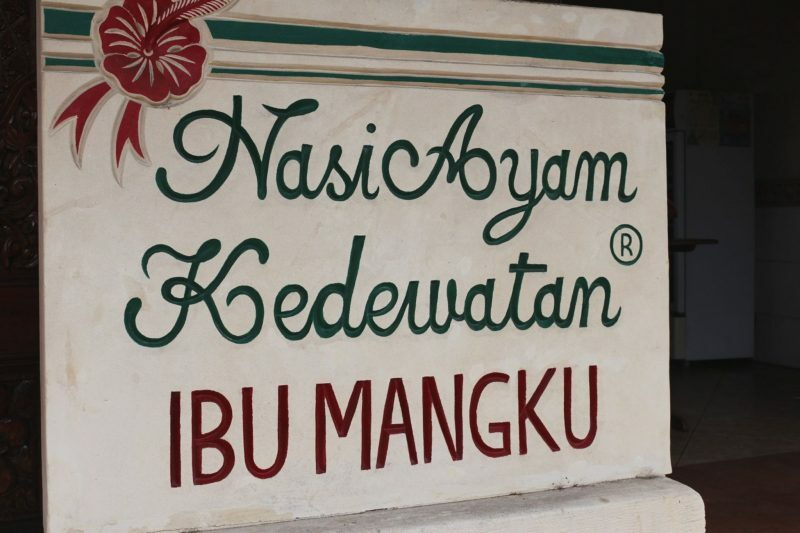 We went for Nasi Ayam Kedewatan Ibu Mangku. Such a long name but basically it is rice served with sauteed vegetables, chicken, Sate Lilit, egg, sambal (spicy paste), and spicy sauces. The star of the dish is definitely the Sate Lilit. 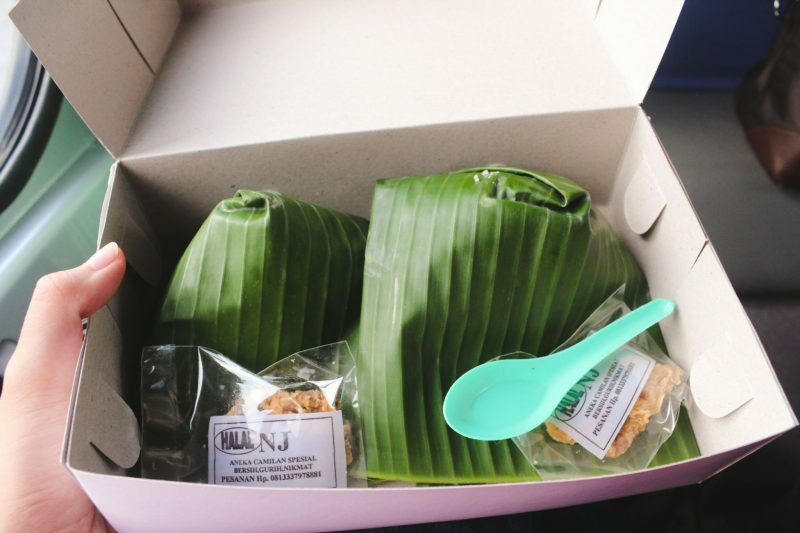 One of the things you definitely must eat in Bali. It is minced chicken, combined with an array of spices including lemongrass, then molded onto bamboo skewers and grilled. 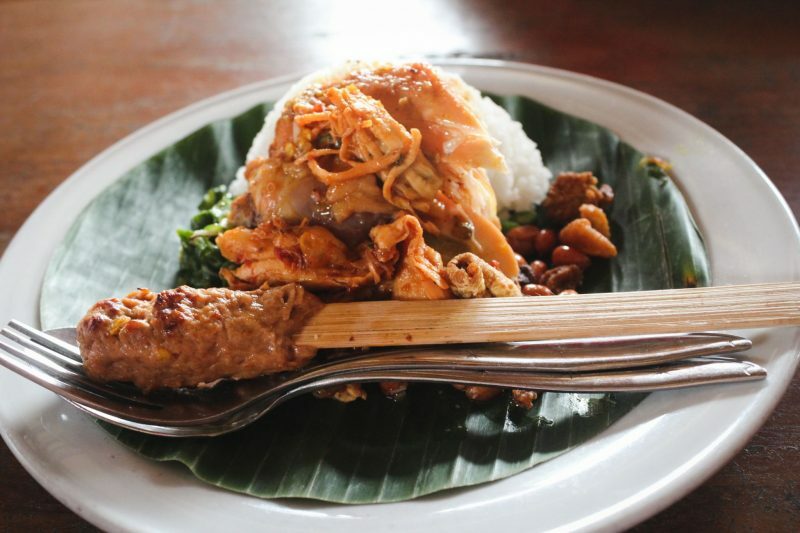 It is located in Ubud area and it cost IDR 25.000 for one portion of Nasi Ayam. 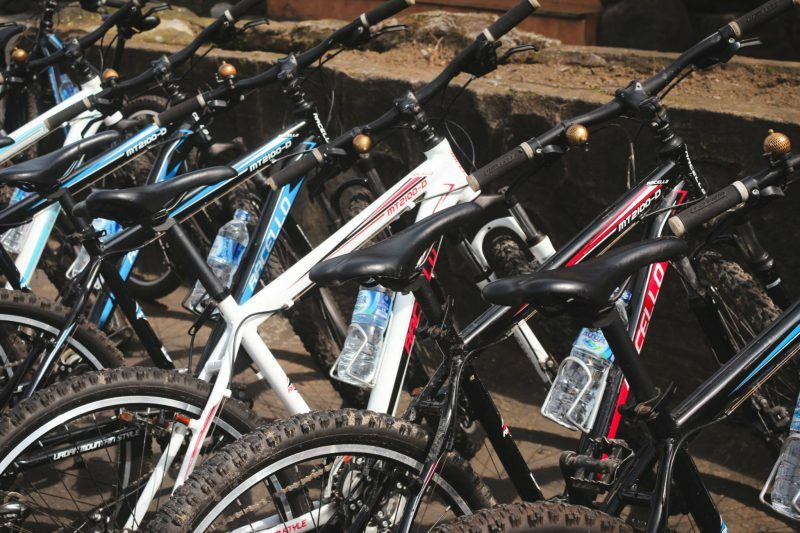 You should try it when you are around Ubud area. Taste good and as per usual, I will let the picture speak for itself. This is the place to go. We also met the rest of the groups here. Including those who missed their flight. 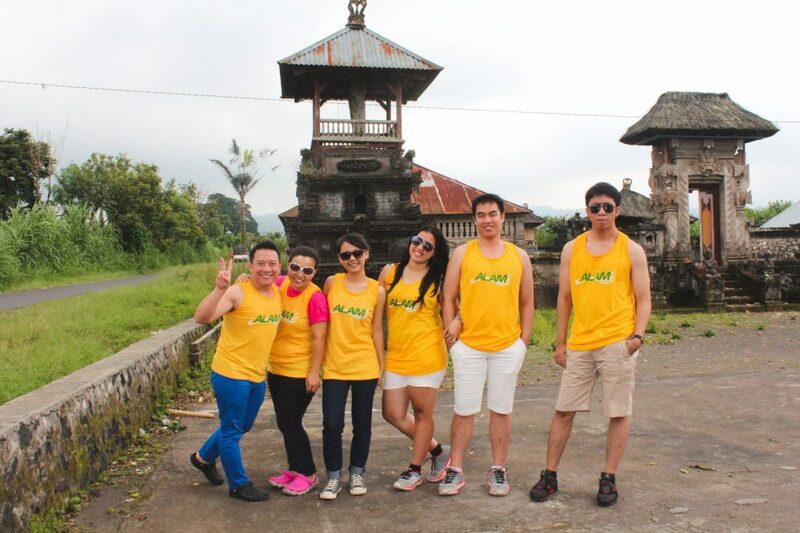 Finally, our group was complete. We all ate lunch and then went straight to our hotel. 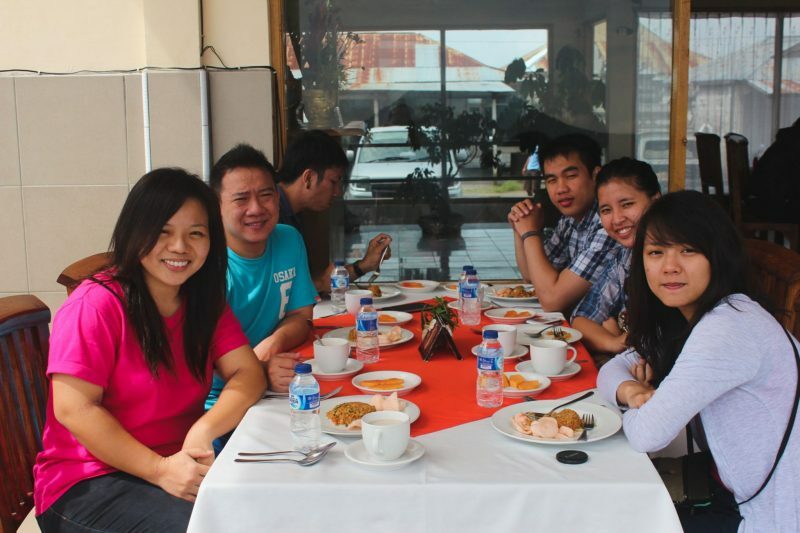 We were staying at Fontana Hotel, Legian. It is a nice hotel. I also have a small review of this hotel for you guys. It took one and half hours to get there from Ubud. The last thing we have on our schedule for today is dinner. Dinner at the Bounty Cruises. It was not a formal dinner or anything. So no dress code or formal attire requirement. Just a casual dinner at the cruise. And the cruise was not a huge ship, not like the titanic size. 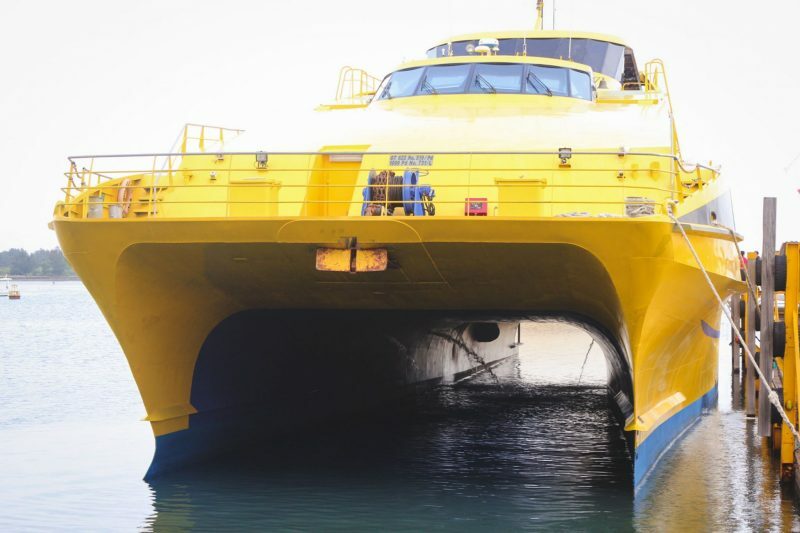 It fit up to 600 people with 3 decks, upper, main, and sunset deck. I am pretty sure that we got a special rate for groups. 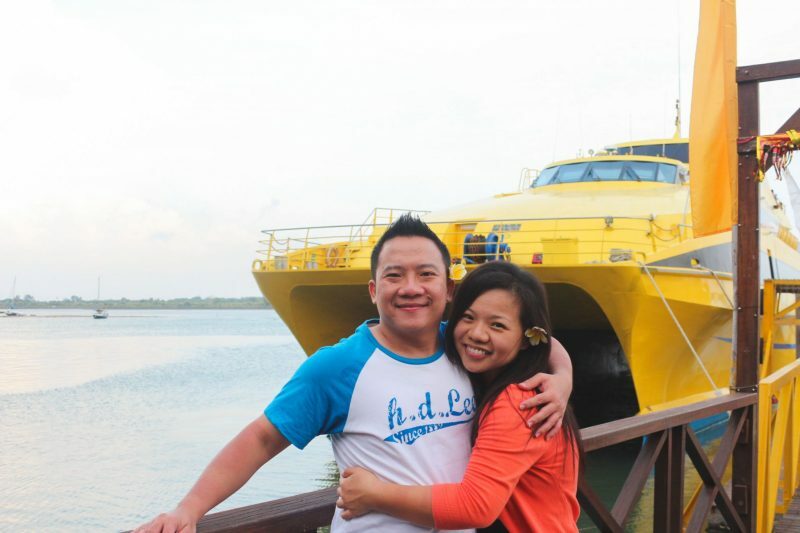 But again, I don’t know for sure the rate that we get so I found a couple of similar cruises which I have put below. Yes, you can thank me later. They board at 5.30pm so after done with the washing up we went straight to the cruise. 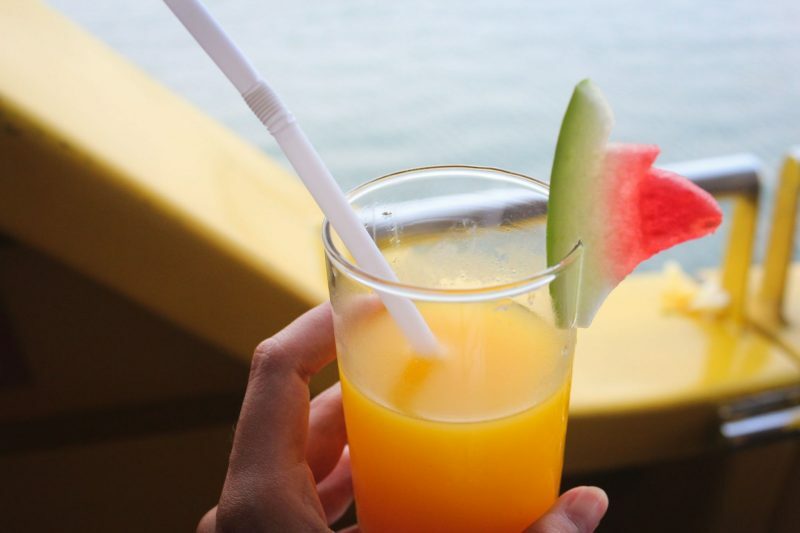 We are given a welcome drink when we first board the ship and a flower to put behind your ears. I think it called Plumeria or in Indonesia, it is called Kamboja, the typical flower that you will found in Bali. 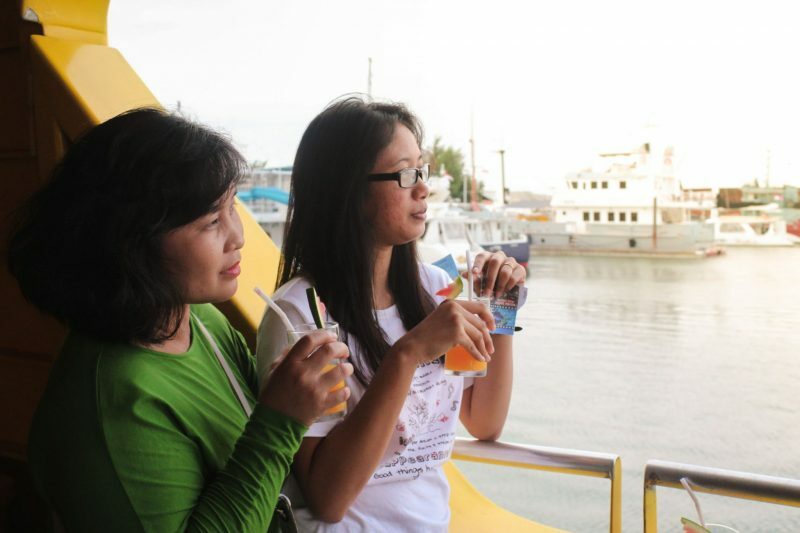 They depart at 6 pm so we have 30 mins to explore around and enjoy our drink. Too bad it was still cloudy when we reach the port so we didn’t really get to see the sunset on the cruise. The sun was not on our side today, it only came out when we did the cycling. Just to gave us some sunburn, d*mn it. Then at 6 pm, we all went down to the main deck, hear some welcoming speech and then it was dinner time. It was a buffet dinner. The dinner selection is alright and it tastes okay but nothing special. After dinner time, it’s basically free time for us to do anything we want. There were performances here and there. The usual shows that you will see on a cruise ship but in a smaller form. They had the magician, cabaret comedy show, live music, DJ, etc. The one that I enjoy the most is the live music outside because I don’t like to stay inside the small room too long. They were mostly playing old school songs, the one that I think my parents will recognize. So the rest of the time I just wander around the ship. For me, this was quite a boring experience. I think it will be more suitable for middle age to older people. 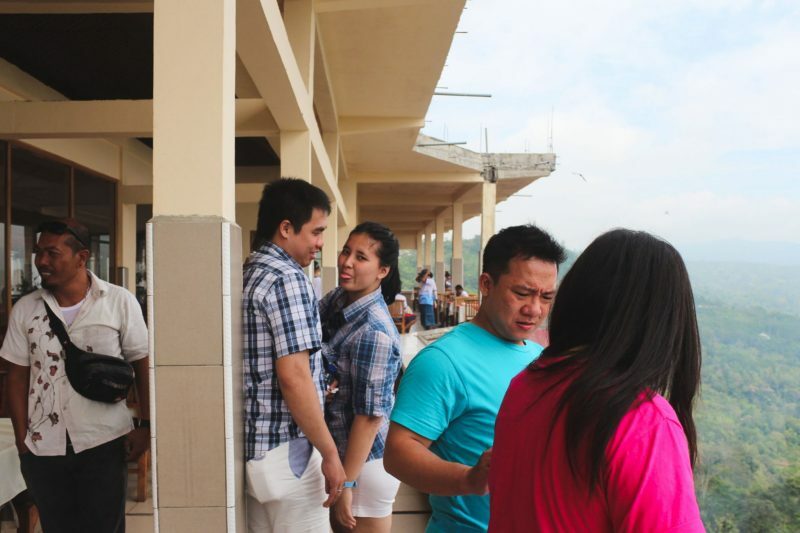 Most of the people in the cruise were either old people or tourist group like us. 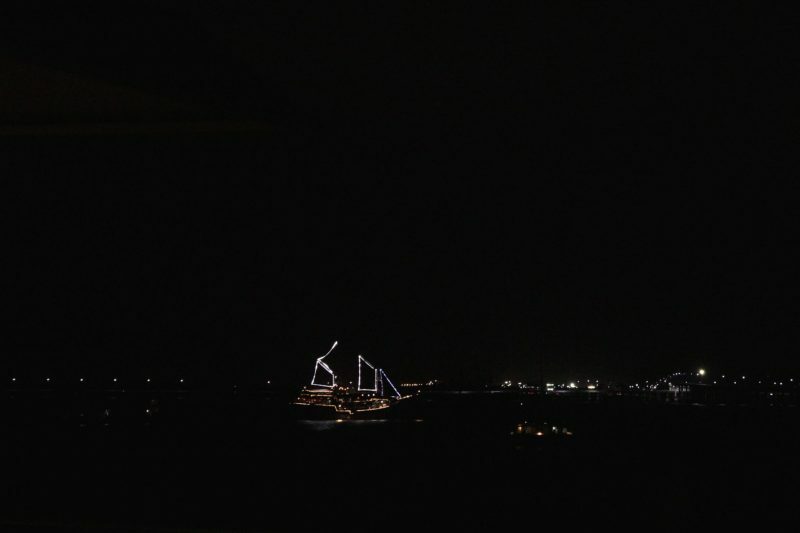 For me, I would rather explore Legian at night time than to be stuck on the ship. There are some shows that are quite entertaining but still I would not do this again. 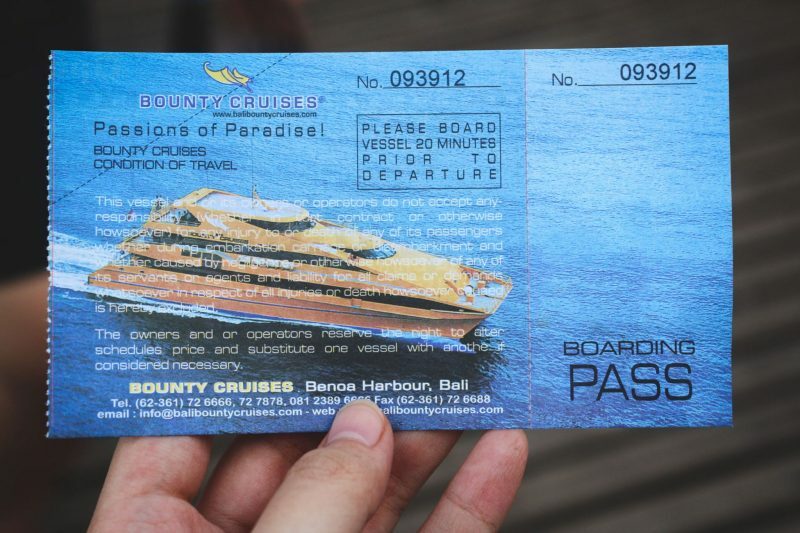 Luckily the cruise only lasts until 08.30pm and we were back to the hotel. Then I went to Legian with some of my friends, stroll around for a but then back to the hotel. It was a tiring day and I could not get any happier to finally lay down on my bed and snooze out. If you have any question feel free to leave them in the comment section below or reach me on my social media. The next time you see me, I will be showing you the second day of the trip. It involves getting wet and some exotic animals. Until then, keep exploring and see ya! Check out best deal to stay in Bali right here! 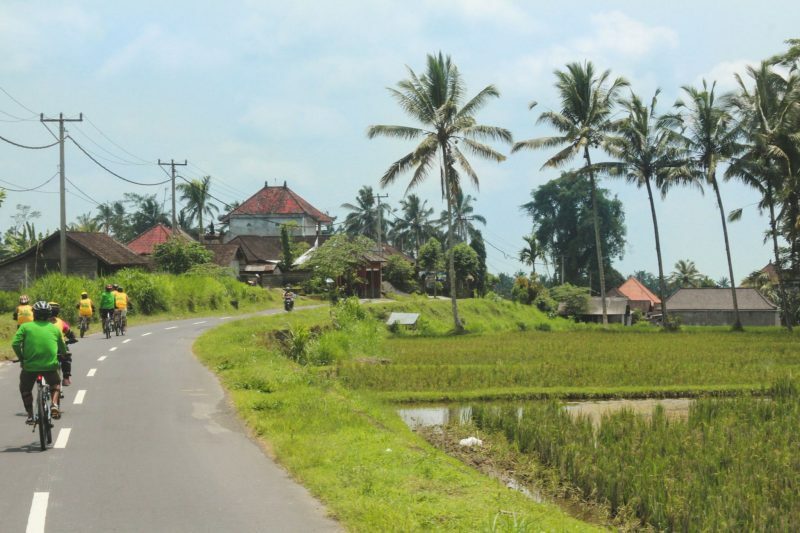 Searching for the best price for flights to Bali? For Indonesians, find the lowest price for your flight here. If you still have no idea what to do here (how come tho), look here then! Last but not least, don’t forget to travel safely. Get your travel insurance. 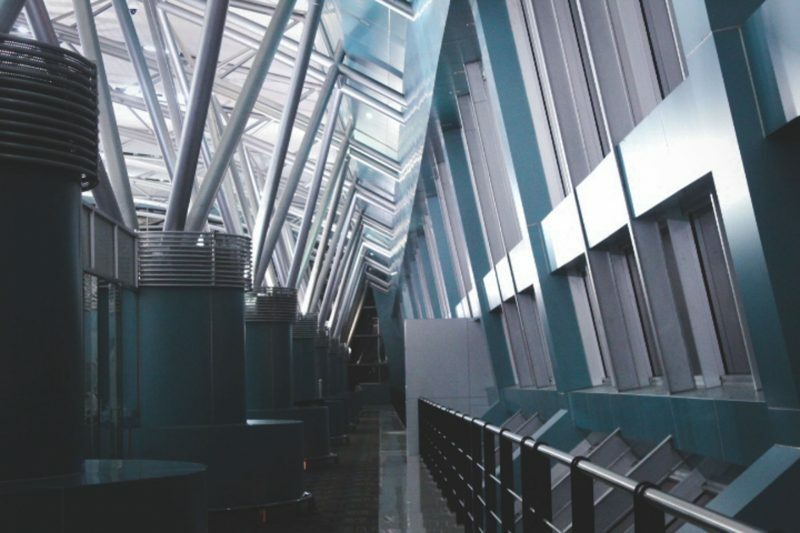 Find out more travel resources that we also use for traveling on our resources page.